bronze bearings to insure life time self-lubrication. Pulleys mounted on rugged 3-lag bracket. For a high level of performance and long life we have selected the highest quality pulleys available. Both the drop line pulleys and main line pulleys have galvanized steel side plates and zinc plated steel sheaves with oil-impregnated bronze bearings. Also, for ease of installation and system durability, we provide a rugged galvanized pulley mounting bracket for both the drop line and main line pulleys. Special pulleys are available for inside and outside exterior corners, for thruwall interior mounting of controller, for counterweight and for unique cable routing needs. All steel surfaces are zinc plated or galvanized. For smooth up and down movement of the curtain and a non-sag curtain top we have selected a heavy galvanized 1˝ O.D. structural tubing (about 2 1/2 times as heavy as 1/2˝ conduit normally used). We also use 20´ lengths rather than 10´ as normally used with conduit. This substantially reduces the number of connections and potential problems resulting from loose connections. We recommend a hem pipe at the top and the bottom of the curtain. The bottom hem pipe holds the curtain without permanently fastening to the building. This provides convenient access for maintenance and cleaning of the curtain and building, as well as fair weather overhead storage. Hem pipe splices are internal for a smooth continuous outer surface. To properly secure the heavy 1˝ top hem pipe to the cable drop line, we have designed a rugged galvanized steel clamp. The design of this clamp features a simple and easy drop line cable adjustment. For strength and durability, all the drop lines are 1/8˝ (7x19), flexible aircraft cable. The main lines are 3/16˝ aircraft cable; 1/4˝ available where required. We recommend 2˝ x 1˝ 14 gauge welded wire. This galvanized product is more rigid than plastic products and is less restrictive to air flow. Tensar polygrid® is available but only recommended for gable or overshot ridge applications. controlled by a thermostat and timer. This unit is widely used in poultry, hog and dairy operations. Galvanized shelf brackets angle up at 45°. In windy situations the bottom of the curtain can lift slightly up and away from the building. Once the pressure is relieved the curtain gently falls back to its neutral position. These uniquely designed brackets eliminate the need for installing treated wood shelving, which often shrinks and warps over time. Wood shelves also trap moisture and bedding in the curtains. The brackets are made from 1/4˝ galvanized steel. The brackets are installed 3´ o.c. and provide support for the curtain as well as securing the retainer line. air inside before being exhausted. welded at the top and bottom edge of the curtain. over the rope hem at the bottom of the curtain. Two heavy duty, 80:1 right angle gearboxes roll up the top & bottom curtains. A shepherd’s crook attaches to the input shaft. A 3/8˝ electric drill (furnished by the owner) provides the power. 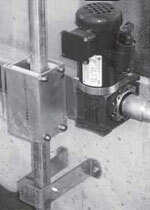 An optional motorized gearbox (shown in photo below) makes this operation even easier. 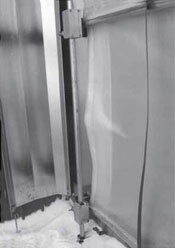 Nylon rollers prevent the gearbox assembly from binding as it easily moves up or down the galvanized guidetube. You can roll up a 200' curtain in less than 5 minutes. A standard system includes one dead end cover permanently fastened to the building and one drive end cover hinged to provide easy access to the gearbox assemblies. Very long systems will have two dead end covers with the drive cover located in the center. 2" wide nylon strapping with tensioners installed 5´ on center are far superior to zig zag cord for protecting the curtain in high wind conditions. Top curtain can be controlled with a manual winch or automatic controller and thermostat. All top curtain hardware has been used on conventional Norbco Flexwall Curtains for over 15 years. 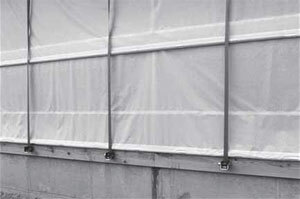 Can be installed on greenhouse, fabric covered, timber column or pre-engineered steel buildings. Many farmers have chosen to add the roll-up storage feature to their single, lift up curtains.